The Duesenberg SJ, a name never used by the Company, was manufactured from 1932-1937 by Duesenberg in Indianapolis, Indiana. It was the supercharged version of the Model J, having 320hp. Only 36 were ever made. Fred and August Duesenberg emigrated from Germany to the United States as small boys. Like many other car builders they started by manufacturing and racing bicycles. By 1903 they were building a car, the Mason. This venture lasted until 1910, when Mason was bought out by Maytag. When they started building cars, they built only racing cars and they put their own name on them. Piloted by famous drivers they were eminently successful. During World War I the Duesenberg brothers built engines for the military but immediately afterward straight-8 Duesenbergs started cleaning up at Indianapolis again. In 1921, a Duesenberg driven by Jimmy Murphy shook Europe by winning the French Grand Prix. In that year too the Model 'A', a fine passenger car, was announced, with a straight-8 OHC engine and hydraulic brakes, the first to be fitted on a passenger car. 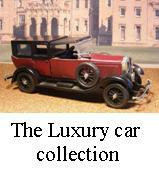 The Model 'A's staid looks didn't do it justice and by1926 only 500 Model 'a's had been sold. In poor financial condtition, the company fell into the hands of E.L.Cord, who already controlled Auburn, and the grandiose Duesenberg J series resulted. It First appeared in 1928 and was built untill 1937. It had a huge straight-8 6.7 litre engine and a chrome nickel crankshaft incorporating a unique vibration damper that consisted of a pair of cartridges not quite filled with mercury. The inertia of the mercury shaking about in the containers and out of phase with the shaft eliminated vibration. Duesenbergs never broke their crankshafts. The SJ had a wide ratio gearbox, not a sports car drivers box for quick downshifts to accelerate out of a corner or overtake, but fast conering was not a Duesenberg's style. A 'Duesy' handled like a hay cart and it's centrifugal blower didn't do much except look nice. An SJ was supposed to reach 129mph, anyone who wanted to test that had to be very brave indeed! A good bespoke body would have cost around $16,000, today collectors are talking of around £1 million for a Duesenberg SJ. The 1934 Weyman Torpedo bodied car was built back in the 1980s. Sprayed from a Humbrol can in the early days of such medium. Humbrol enamels were used for the detail painting. Rod has used cotton for detailing the engine, a common detailing materal in the many decades of modelling before aftermarket products arrived. This 1932 SJ Saloon model has been restored from a motorised kit donated to us by Mr. Derek Bonus. Derek, while a Sub-mariner, traversed the world a couple of times during his service years and in his travels bought several models which he built on board ship while at sea. Strangely Derek was allowed to take adhesives on board but not paint, so all his models were assembled but unpainted. When the time came for Derek to ‘downsize’ and move to a smaller house he decided to sell his models, but of course nobody wanted to buy built models and so Derek donated his collection to the Motor Museum in Miniature where the models are being restored. This restoration has been made converting it to a kerb-side model, removing all the motorising parts but retaining and using all other original parts. 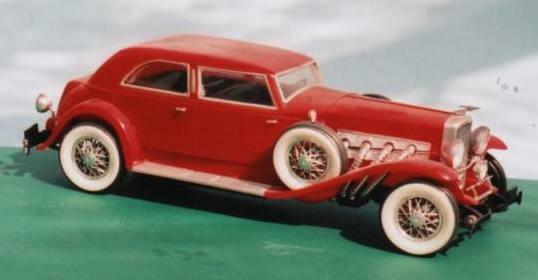 The model is very similar to the Monogram kit of the Duesenberg and some parts are identical but we have never seen this model in the Sedan body form elsewhere. If anyone can help identify the model and supply kit details we would be grateful. They seem to make a nice pair whatever the origins.